These southwestern switchplate covers with their petroglyph designs are versatile enough to go with your southwest, western, cabin or mountain decor. They are the perfect way to accessorize and pull together different rooms in your home. Important Note: When selecting the number of switches for your switchplate cover, please don't get confused by the numbers on the drop down form. For instance Triple(+6) means that the triple switchplate is $6 more than the base price for the single switchplate which is $14. This is how we program our shopping cart. So the (+6) has to do with pricing, rather than with the number of cutouts for the switch. A triple is a triple. We hope this clears up any confusion. Each decorative switchplate cover comes with matching screws for easy installation. When installing them, please be careful not to overtighten the screws as the switchplates are somewhat fragile. Be extra careful installing them on obviously bowed walls. Order-to-shipment time is approximately 3 weeks. 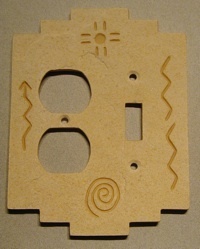 Get your southwestern switchplates today!